Do you ever watch curated morning routine videos on YouTube? I’ve spent too many nights falling asleep in a black hole of perfectly made beds, sweat sessions and freshly made coffee hoping that I would have the same morning when I got up. Unfortunately, my reality is often snoozing my 5:30 a.m. alarm enough times that I leave about 10 minutes to pick an outfit, swipe on some concealer and run out the door with a hardboiled egg in hand. After a couple months of my extensive train and subway commute, I decided something had to change. Either I could continue being miserable about all the things I was missing in my day or I could find a way to improve my outlook. Luckily, at this exact moment, a friend gave me an extra Five Minute Journal. Five minutes to journal, I thought to myself, what’s the harm in giving that a try? I’ve always really enjoyed journaling – as a creative and an extreme overthinker, I find it incredibly therapeutic to be able to write down my thoughts and have a safe space for to store my memories for safekeeping. But while I tried to balance work, commute and social life, I was finding little time to sit down and write about all I was feeling. Cue my interest in testing the Five Minute Journal, my easy approach to getting a few minutes to review my day and make me a little bit happier. The journal is really easy to use. It is based on positive psychology research and makes you check in with yourself each morning and night. When I committed to journaling using this approach, I started each day writing down three things that I was grateful for, three things that would make the day great and a mantra for the day. At the end of the day, I would write three great things that happen and one thing that could have made my day better. Today marks 82 of using the journal. 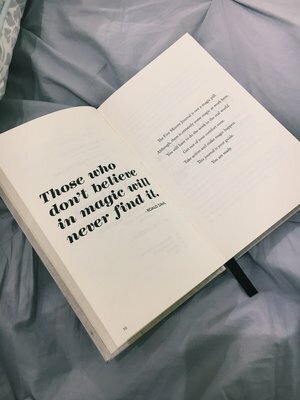 I genuinely believe it has made me more positive – sometimes subconsciously and sometimes because I think to myself “how would I write this in my journal to make it better’. As annoyingly cliché as it sounds, I feel like it’s trained me to take a more positive view of things that are challenging me. The practice of journaling daily has also made me realize, even on the hardest days, how much I have to be grateful for. It is so nice to know that even when you are tired or stressed, you are still able to think of three things you are happy to have in your life. Finally, the journal has helped me to set goals and reflect on them. If I am trying to have a more Healthy is Hot approach to my life, I can write that down as one of the things that will make my day great. If I achieve it, I get to write it down again at the end of the day as something that made my day great. It’s like a built-in checklist for my life without being too overbearing since it is only three lines. Overall, I have been really pleased with the effects of this type of journaling. It has been much more manageable for my hectic life than other forms of record keeping. It makes me happy and helps me encourage others to look more positively at the situations they are facing. I would definitely recommend to a friend. After all, what're five minutes?